Carbon Fiber ruled the attention of the day of a very competitive 2015 Firestone Grand Prix of St. Petersburg that featured five time-consuming full course YELLOW Flags to sweep up and haul off wing elements of latest aerodynamically modified Dallara cars. Honda front wings were the most vulnerable with a final wing change tally of seven while Chevy only required one front wing to be changed. Less parts mean stronger parts (Chevy's apparent philosophy) ... the rule governing aerodynamics is that the new wing can be made in most any way the manufacturers choose ... but that the final wing can weigh NO MORE than the original DW12 Dallara wing - to repeat Honda - 7 / Chevy - 1 ... and as in golf, the low number is the winner here. The other thing that was confirmed with this race was that the turbulence mushroom is NOT being lifted up off of the racing surface as before. Both Scott Goodyear and Eddie Cheever (color commentators on the ABC broadcast) mentioned that many of the drivers, Tony Kanaan - piloting in his second year for Target Chip Ganassi - being the most vocal, were mentioning that the cars become unstable farther away from the leading car than before. This is something we mentioned was going to happen just after the aerodynamic body element designs from Chevy and Honda were revealed <<< HERE >>> when our colleagues saw the way these aero parts looked and the way they were designed. Where this showed itself the most clearly on the track was the front straight away ... at full speed. Very little passing took place at the end of the straight, save for restarts when the cars were at slower speeds. Toward the end of the race when Will Power was tracking down teammate Juan Pablo Montoya ... if this was a race with the old aerodynamic template of one year ago, Will would have been more patient and would have felt, with the fact that his car was stronger (he made up a 3 second deficit in just a few short laps), he could have more options to pass. Looking at the drive, what he actually felt due to turbulence at high speeds ... that Turn 10 presented the only 'surprise' opportunity. Granted, he, Will Power, had a few more laps to pounce, but the only opportunities would come at the twisty bits at Turn 4 or Turn 10 against someone with a very, very fat car. Precarious practice: With the aerokits for Honda (“Slats”) and Chevy (“Extra Bits”) being brand new and spares being scarce, practices were fairly quiet. Quite a few run-offs but contact was avoided at all costs. The one thing that did take a beating was the track record. Loads of downforce with the kits and speeds were climbing quickly. Penske perfect: The four Penske cars took the top four positions in qualifying after putting in powerful practice sessions. It was Power, Pagenaud, Castroneves and Montoya. Lots of Extra Bits to lead the way at the green. Papier-mâché parts: As many predicted, debris cautions were the bane of this race. ABC even displayed a wing damage tracker at one point. Slats took the brunt of the damage, spraying bits of cat-mangled Venetian blind parts all over the track. Caution after caution kept the race from developing a real rhythm, which is not uncommon for St. Pete, but the parts sprayed with much lighter contact. Penske party plus papa: New papa Tony Kanaan broke up what would have been an otherwise all-Penske podium. 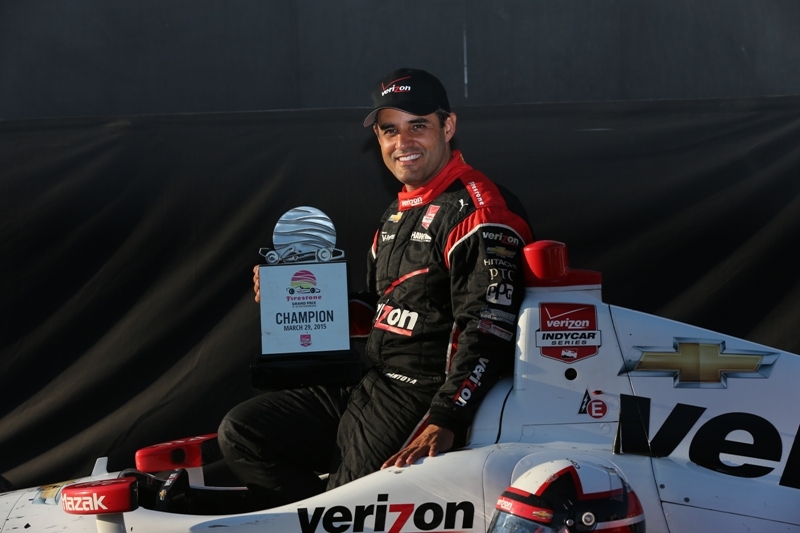 Montoya and Power took the top two steps on the podium, with Castroneves and Pagenaud filling out the top five. From the looks of things right now, The Captain has the best boat in the water. New #IndyCar aero kit winglets look ridiculous. They cause too many cautions too. Wow, does Juan Pablo Montoya look like his 1999-form one race in to season or what?! JPM continued his success from the second-half of 2014 right away in 2015, nailing his in-and-out laps on his last pit stop to jump ahead of Will Power on pit sequence to capture the win. Not only did he hold off Power, but JPM was also quick all weekend. If JPM continues in this form, the rest of the field may be in trouble. Along with JPM and Power were the other two Team Penske drivers of Helio Castroneves and newby Simon Pagenaud. Together, the four drivers took the top four spots in qualifying (something I think has never been done in IndyCar) and captured four of the five top spots in the race. Of the four, Pagenaud had to overcome the most adversity, getting put mid-pack several times and damaging his front wing, but he still found a way to finish in fifth. I have a feeling Team Penske will appear in the Winners category of these blogs for a whole lot of races this season. The man who denied Penske of their 1-2-3-4 finish is Tony Kanaan. Kanaan had a solid weekend, continually showing pace and keeping a very clean nose on his way to a P5 finish. His other teammates Scott Dixon (air-jack issues), Charlie Kimball (multiple incidents), and Sage Karam (not sure what his deal was, maybe just simply put being a rookie?) couldn't hold a candle to him in the race. During the broadcast, the ABC analysts talked about Kanaan becoming more comfortable within the team. Remember that before yesterday, Kanaan was the last driver to win a race in the series (Fontana '14). Like JPM, if Kanaan can keep up his form from the second half of last season, the other drivers might be in trouble. Was it the greatest race in IndyCar history? Of course not. There was debris cautions for days (at least there was legitimate debris on the track and not phantom debris cautions or menacing hot dog wrappers like that other series) that took forever to clean up. There were times of stale action where we had to talk about how great Marco Andretti was doing in P13. But overall, the race had moments of excitement, including ballsy passing and dramatic, albeit boneheaded moves on the track. I enjoyed the speed, the passes, the aggressiveness, and the slight strategy that took place which didn't involve an entire race of fuel conservation. Overall, I am very pleased with the race that took place! 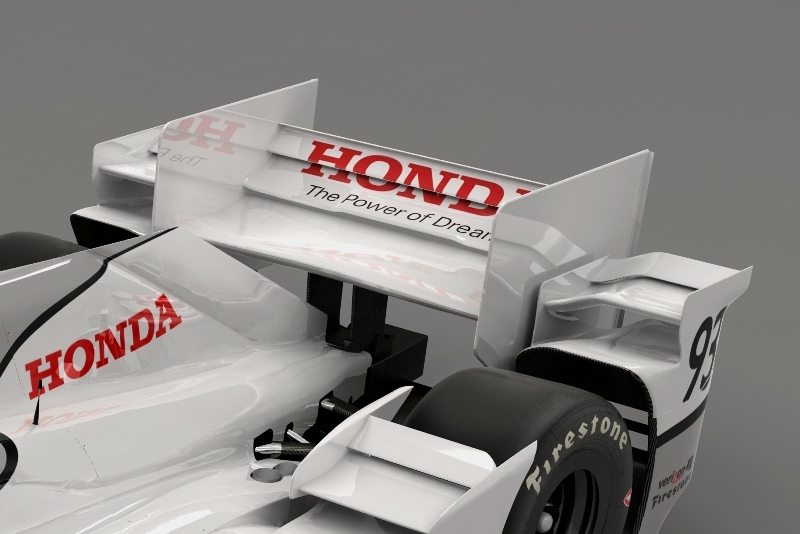 What's stronger: Tony George's rationale for creating the IRL or a Honda front wing? 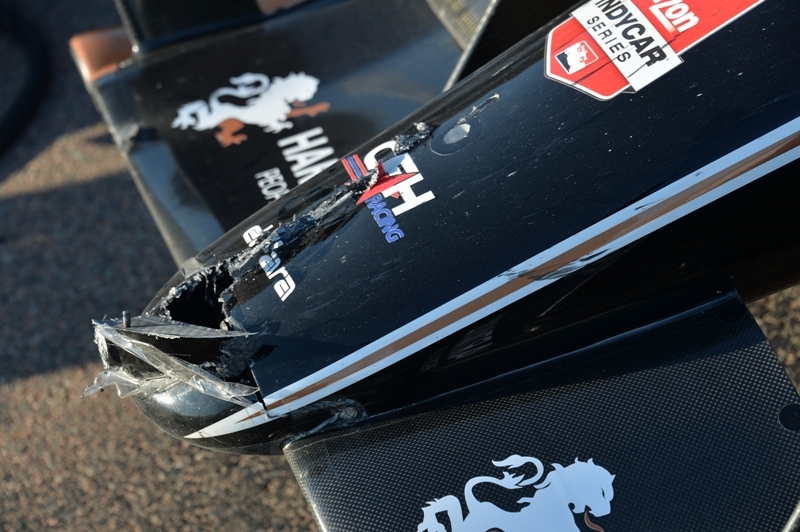 The Honda wings, which kept getting damaged throughout the race, were so weak that ABC began having a counter of wings broken between Chevy and Honda. At one point, Honda was "leading" 7-1. That's awful. 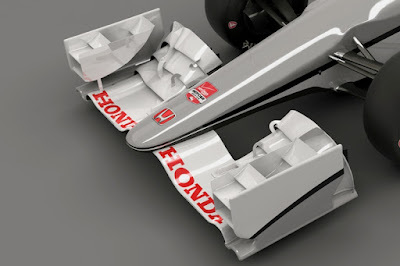 As mentioned during the broadcast, the front wing designs had to meet the same weight that they were in 2014 after the modifications, so obviously Honda did not make a sturdy enough wing. Either that or their drivers are all knuckleheads. A driver that really needed to have a great race was Simona de Silvestro. 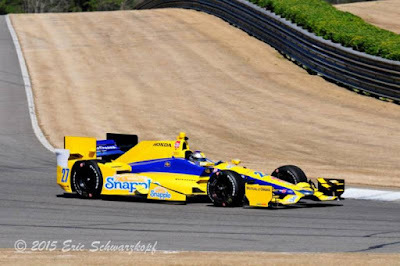 For Simona, the raced served as a tryout for Andretti Autosport for future races or possibly the 2015 season. She qualified well, despite being down during some practice sessions. In the race, well, it didn't go too well. She was involved with teammates Ryan Hunter-Reay and Carlos Munoz early on. RHR passed her in turn ten. Seeing his successful pass, Munoz tried to follow. While I would pin most of the fault on Carlos, being in any incident with your teammate, regardless of fault, is not good. In the grand scheme though, this incident wouldn't matter if Simona could rebound. Later on, she missed her braking zone by a lot (my words exactly were "wasn't even close," which were later echoed by Eddie Cheever) and rammed James Jakes. Jakes race was ruined, and Simona suffered damage. Overall, a P18 was not what Michael Andretti had in mind. Francesco Dracone finished P23 and Carlos Huertas P24. Need I say more? 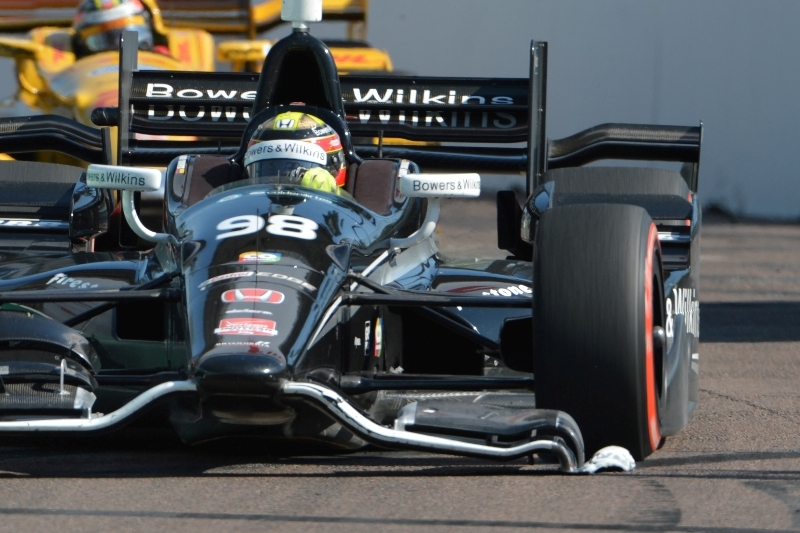 Gabby Chaves was unflattering in his first race of the season. Early on in the race, Chaves was seen slowing down abruptly on the exit of a turn, causing Marco Andretti to run into the back of him (I'm not one to defend Marco often, but he's right in this situation) leaving Marco with a damaged front wing. Accidents happen, that's fine. But later on. Chaves really misjudged a maneuver on James Hinchcliffe, leaving Hinch with a flat tire for one lap and effectively ruining his race. Hopefully Chaves tones down the miscues for the remainder of the season. Graham Rahal gained a lot of "fans" following the race. 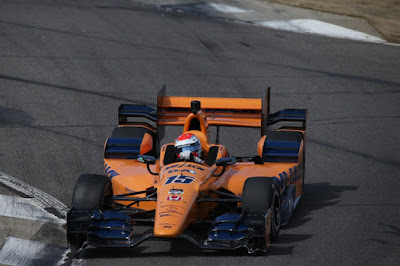 To recap what set him off, Charlie Kimball got damage from contact (from I believe Simon Pagenaud), leaving his rear guard with a serious rub on his rear tire. Half-a-lap later, Graham, who was following Kimball, decided to try to make a move around the damaged yet still on-pace Kimball. Rahal put Kimball into the tires and received a penalty. People noted that Graham said over the radio, "They'll find any way they can to screw me, it's just the way it goes." Hold on now Graham. Please tell me how IndyCar screws you? a) the incident was questionable, I could see fault with both drivers. b) you've been irrelevant outside of two or three races since 2013. IndyCar hasn't had a chance to screw you out of a good result. c) maybe, MAYBE I'll take that argument from Will Power, but not you. After finishing P11, which isn't bad, Graham took to Twitter and was, well, colorful. Now I am not a fan of @TonyJWriter (he blocked me, we just don't like each other), but he and Graham got into after the race. Graham made the argument that anyone who knows anything about racing knows that he shouldn't have gotten that penalty. Well, apparently I know nothing about racing. Tony tweeted, "Gotta have a better argument than "If you don't agree with me, you know nothing about racing." I agree with Tony (gasp, I know). I can't exactly declare myself innocent of never being stubborn on a subject, but Graham was way out of line here. Denouncing anyone with a differing opinion as yours as a "hater" is obtuse. I am not oblivious to the fact that Graham does have trolls who are pretty ruthless, but those who rationally disagreed with him aren't "haters." My immediate reaction to the incident was a flashback to Long Beach in 2014. Both Graham and RHR would have been well off by waiting a couple turns to capitalize on a off-the-pace car rather than forcing a pass. But hey, I don't know anything about racing. There was a bunch of frustration to go around for everyone with two new aerodynamics templates to figure out. 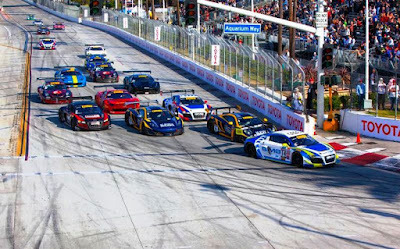 For the fan, when we get to the long 185mph straight of Shoreline Drive at Long Beach and short ovals, the frustration will come, in old IRL style nose-to-tail racing we all hated during the era of the original "Crapwagon" Dallara. It is sad to say this early on, but it almost looks as if too much was being done in the off season with Extra Bits and Slats but not enough was being done to protect the competitive Mushroom Busting characteristics of the original DW12! Hot laps on a Suzuki super bike at The Thermal Club. Two-time AMA Superbike and three-time FIM 500cc World Champion Wayne Rainey says he’s just a cog in the wheel of MotoAmerica. Wayne Rainey of MotoAmerica talking with Racer magazine. 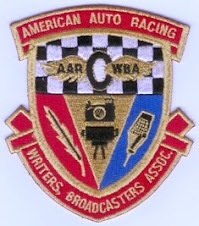 That’s the affiliate American motorcycle road racing series of the KRAVE Group, comprising Terry Karges, Rainey, Chuck Aksland, and Richard Varner, which purchased the commercial rights to US road racing from the AMA this past September. In actuality, the 53-year-old Californian brings a familiar face, legendary determination, and international support to a national superbike style motorcycle championship that has struggled for years under mixed leadership. The first race (of a nine race season) of this inaugural MotoAmerica racing series is just a few short weeks away - Friday through Sunday, April 10-12, 2015 - and will begin paired with the European run MotoGP Red Bull Grand Prix of the Americas event at Circuit Of The Americas outside of Austin, Texas. The Thermal Club provided a perfect backdrop to the unique promise MotoAmerica represents ... it is time for the United States to re-establish itself as an environment for racer and competition development. And ... Yes! - This bike, and this racer, depicted in the video above (#18 GEICO Suzuki MotoAmerica Superbike - Chris Ulrich), was the combination members of the media were treated to tag-a-long rides on, and with. This is the fourth in a series of Yamaha-produced videos documenting the development of the new Monster Energy Graves Yamaha YZF-R1. This special Yamaha development will be raced by factory riders Josh Hayes and Cameron Beaubier in the Superbike class of the 2015 MotoAmerica AMA/FIM North American Road Racing Championship. The season-opening event is scheduled for April 10-12 in conjunction with Round 2 of the MotoGP world championship at Circuit of The Americas in Austin, Texas. Will Power‘s time of 1:07:3118 seconds for Penske Racing topped day two of the two-day Verizon IndyCar Barber Motorsports Park test, which translates to a whopping 123 miles per hour on the undulating road course. Scott Dixon driving the Honda-powered Target Chip Ganassi Racing DW12 holds the track record at the road course facility in Alabama, without the benefit of aero kit, and it stands at over a half-second quicker at 1:06.7750 (set in 2013) than Power’s aero kit aided record time achieved on Barber's Tuesday test. As for Honda-powered and areo kit prepared teams, Graham Rahal led the way for Honda, posting the fifth-quickest lap time in the final session on Tuesday afternoon, seventh quickest during the full two days. Driving for A.J. Foyt Racing, veteran Takuma Sato was seventh quickest in the final practice, and 10th for the full test; while James Hinchcliffe made a successful debut with his new Schmidt Peterson Motorsports team, turning the 10th-quickest time in today’s final session. 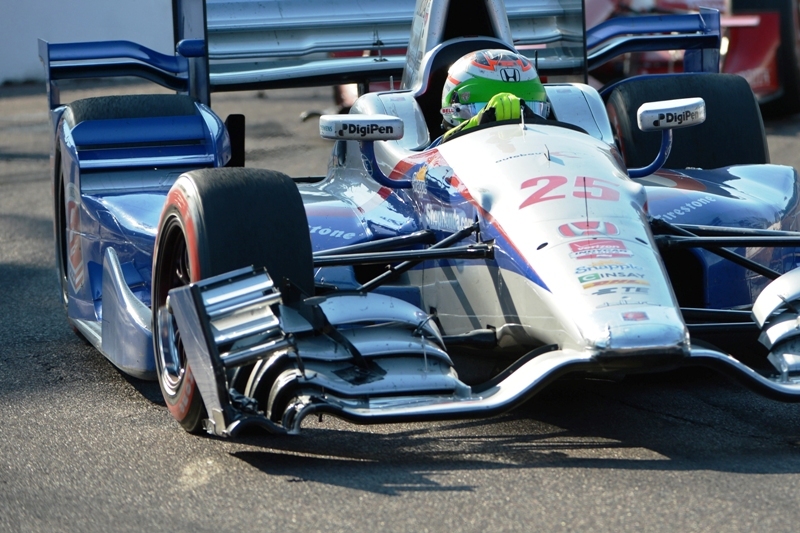 In all, 21 drivers (of 23) posted times below the pole qualifying time from the 2014 Honda Grand Prix of Alabama. 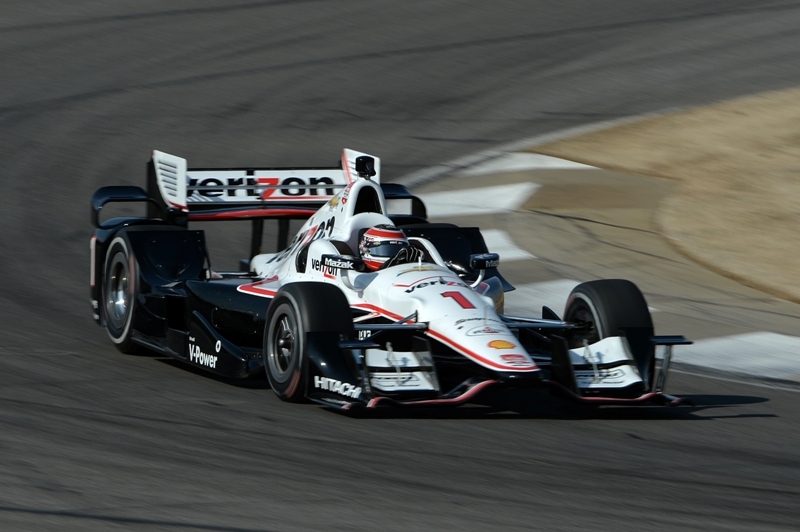 The new-look Team Penske Verizon IndyCar Series program got back to business after a busy off season with two days of testing on Monday and Tuesday at Barber Motorsports Park near Birmingham, Ala. Team stalwarts Helio Castroneves, Will Power and Juan Pablo Montoya, along with newcomer Simon Pagenaud, all took turns laying down some impressive lap times around the picturesque circuit as the teams got their first experience testing the new aerodynamic body kits that have been introduced to INDYCAR this season. All four drivers placed inside the top-five on the practice charts on day one of what is referred to in the INDYCAR garage as “Spring Training.” Driving the No. 22 Penske Truck Rental Dallara/Chevrolet, Pagenaud led the way with a lap of 1:07:5329 seconds in the afternoon session, which was the second-fastest of the day overall. Power, the defending series champion, came in with the third-fastest lap – also set in the afternoon session – with a time of 1:07:5495 seconds in the No. 1 Verizon Team Penske Chevy. Montoya, piloting the No. 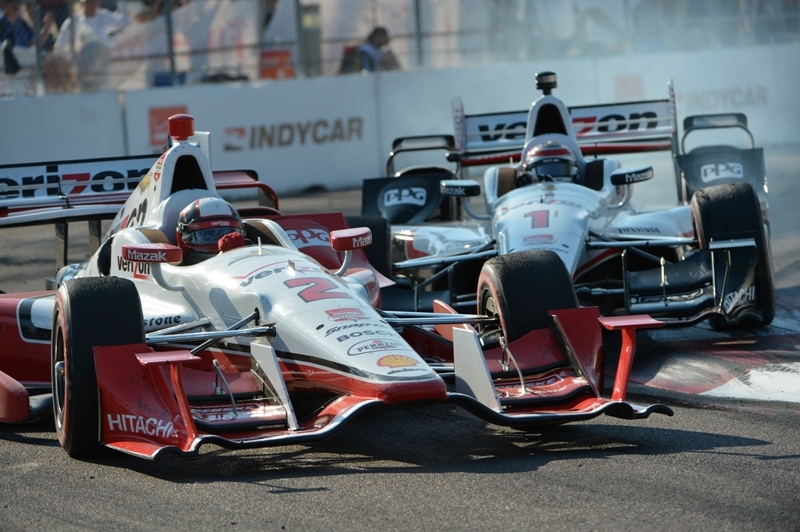 2 Verizon Team Penske machine, and Castroneves, racing the No. 3 Hitachi Team Penske Chevrolet, rounded out the top-five fastest cars with times of 1:07:6266 and 1:07:7703 seconds, respectively, in the afternoon session. Power turned 70 laps on the first day, the second-highest total of the 23 drivers in attendance. Castroneves made a total of 57 circuits, with Montoya and Pagenaud lapping the track a total of 53 times a piece. In all, 16 drivers turned in times faster than Power’s pole-winning lap from the 2014 race at Barber, demonstrating that the new aero kits are going to bring about some fast times throughout the season. The second day of the test provided a bit warmer climate, but that did not slow down the Team Penske Chevys. Power led the morning session on Tuesday with a lap of 1:07:3118 seconds, which turned out to be the fastest lap of the test. Castroneves posted his fastest lap of the test in the afternoon with a time of 1:07:5304 seconds, good for the fourth-fastest overall time. Pagenaud’s time in the afternoon session on day one remained his fastest lap of the test and the fifth-fastest time overall. The same was true for Montoya as his time from the afternoon session on Monday was good for the ninth-fastest time of the test. In all, Power led Team Penske with a total of 157 laps turned during the productive two days on track. Pagenaud completed 155 circuits with Castroneves and Montoya touring the course 141 times and 140 times, respectively. The pit crews on all four Chevrolet entries were able to gain valuable preseason experience on a pit road where they will be competing during the season as all teams practiced live pit stops on the second day of testing. 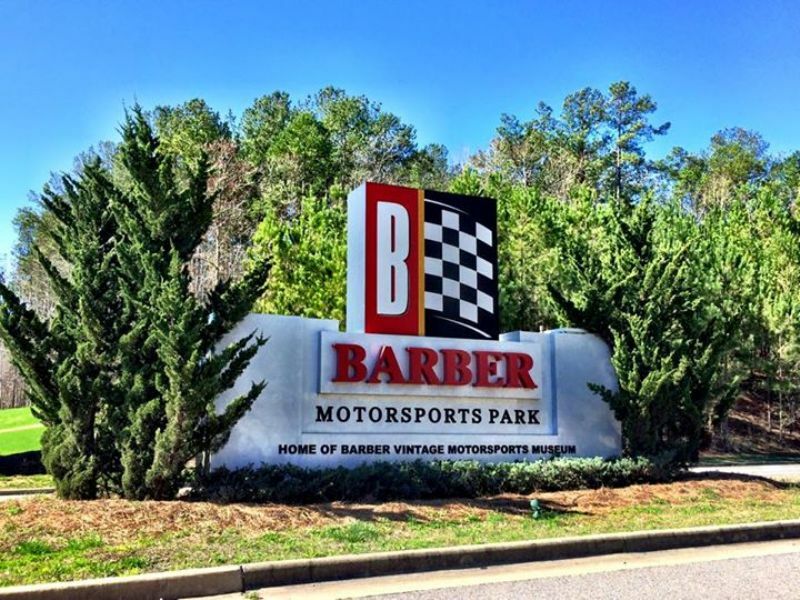 Team Penske and all the other Verizon IndyCar Series teams will return to Barber Motorsports Park for the fourth round of the championship – the Honda Indy Grand Prix of Alabama, April 24-26. 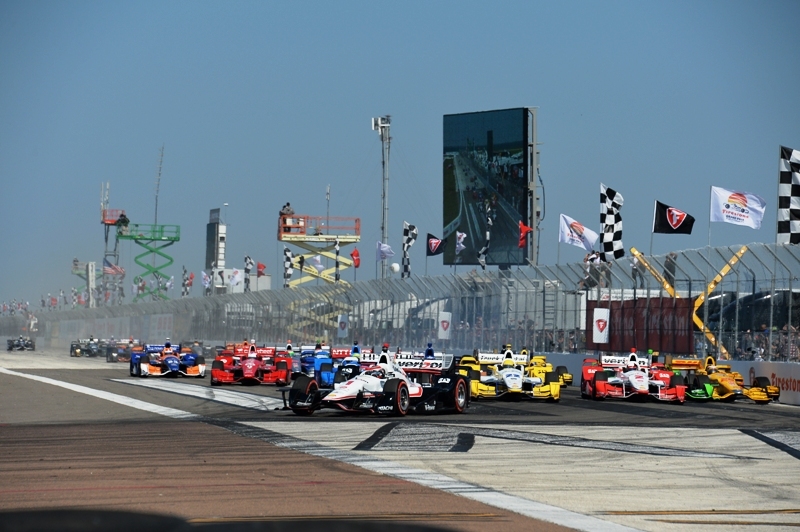 The first race of the 2015 Verizon IndyCar Series season will be the Firestone Grand Prix of St. Petersburg (Fla.) on March 29. Power is the defending winner of the event. Castroneves has won the race three times, more than any other driver. With the Chevrolet-powered and areo kit prepared teams filling the eight positions in the top ten speeds registered during the two day test at Barber, the cars powered and outfitted through Honda Performance Development have some catching up to do. At the end of last year, Dave Allen was named President of Auto Club Speedway by the parent company, International Speedway Corporation, President - John R. Saunders. Dave was picked to succeed Gillian Zucker, who recently became president of business operations for the Los Angeles Clippers Basketball team after a 9 year run at ACS. Gillian came to be President of Auto Club Speedway after stints in executive management of Kansas Speedway and Daytona International Speedway. The track, initially called California Speedway, was built in the late 1990s by racing mogul Roger Penske. Allen joined Penske at the track in 1999 and became senior director of sales and marketing in 2002. Allen most recently served as the track's vice president of sales and marketing, and helped Zucker complete the naming rights with Auto Club of Southern California in 2008. 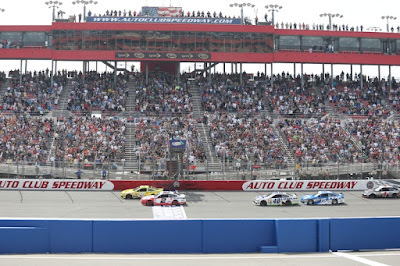 In 2015, there have been a few motorsports events already at ACS - but none are as large in terms of fan interest as next week's event, The Auto Club 400 with NASCAR on March 22, and the MAVTv 500 Verizon IndyCar Series race set for June 27. You have been involved with Auto Club Speedway since near its beginning - What has most impressed you about the facility and its evolution through the last 16 years since you came on board? 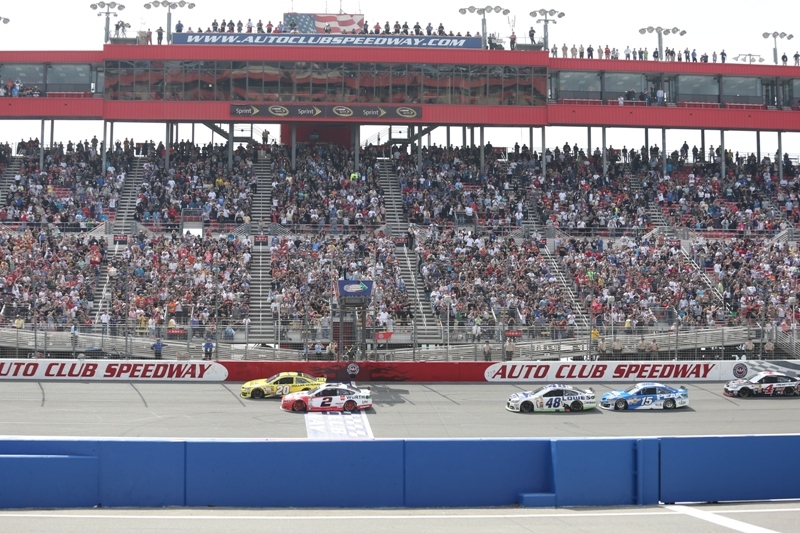 Last Thursday, it was announced Auto Club Speedway will upgrade its safety features in Turn 1 by adding about 600 feet of tire-barrier inside the turn. What are the future plans and timing concerning a more permanent solution to safety and walls around the track? Contributed from Facebook: When was the track last resurfaced? - Any plans on resurfacing the track? The facility at Auto Club Speedway has a large infield - Indianapolis Motor Speedway, where the Indy 500 is held, has successfully transformed its infield into a very compelling road course race track - reminiscent of the layout pace found at the track in Portland Oregon ... is Auto Club Speedway planning on attracting additional professional racing through a robust road course addition as IMS has done? Speaking of road course racing, March 10th, you were in a track event promotion on involving golf with multifaceted racecar driver AJ Allmendinger - who, by the way, is having his most promising start to the 2015 NASCAR season (currently P5 in points) with the Kroger/USO sponsored Chevy of JTG Daugherty Racing. Tell us how this came about and some of the impressions and conversation you had with the IndyCar, Sports Car, and NASCAR driver during this golfing challenge. The NASCAR Hauler Parade begins the NASCAR weekend on March 19th at 5:00pm PT, with Qualifications on March 20th in a knockout format - please highlight the events surrounding Qualifications? What do fans need to be on the look out for while attending Race Day for the Auto Club 400 with NASCAR this coming weekend on March 22? •	Free parking, unbelievable menu items and a full weekend of entertainment, live music and fun await fans in the Speedway’s FanZone. •	Tickets start at $45. To purchase tickets call 800-944-RACE (7223), log on to www.autoclubspeedway.com or visit the Auto Club Speedway Ticket Office. •	Fans can take Metro Link from Lancaster, Oxnard or Oceanside directly to the track for $19 roundtrip. 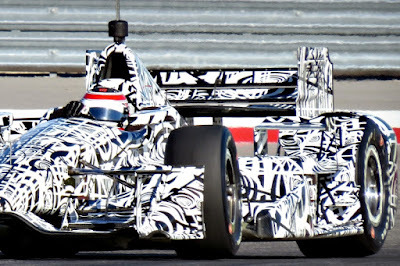 The evening of Monday, March 10, 2015 saw the final reveal of the aerodynamics body panels (Front Wing, Sidepods, Rear Wing) for the beginning of the third season of the Dallara DW12 chassis. Chevrolet introduced its road course/street course and short oval design Feb. 17. 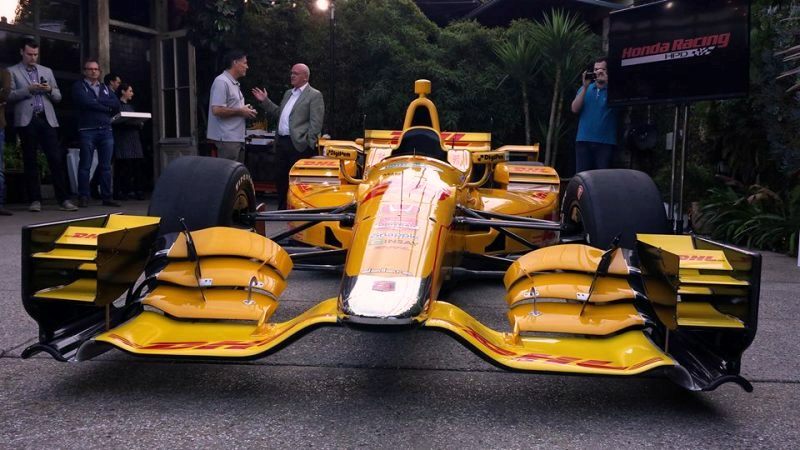 The much-anticipated unveiling of the Honda aero kit took place Monday evening at a reception attended by principals from Honda Performance Development, American Honda and IndyCar. Defending Indianapolis 500 winner Ryan Hunter-Reay, who drove for a bulk of the on-track development, joined Honda executives in showcasing the base road/street course and short oval aero kit. 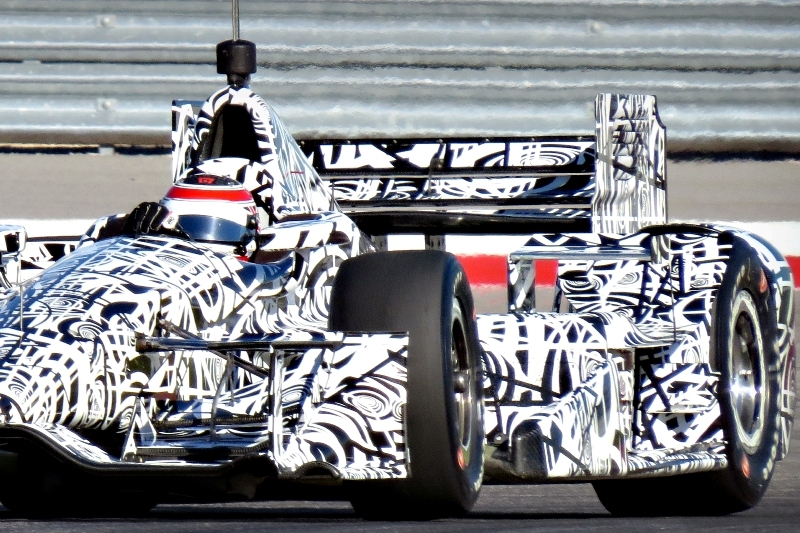 Chevrolet and Honda, the current engine suppliers to the Verizon IndyCar Series (America's top professional open wheel chassis motorsports racing series), under the rules laid out for 2015 are able to modify the original body work of the Dallara DW12 to enhance the racing platform as it relates to airflow and give, potentially, an additional advantage to the teams that use their engines. The previous two years that the Dallara DW12 was on the track, all body parts were exactly the same as manufactured by Dallara from the factory for all teams (Honda or Chevy). The reveal timing all seems a little delayed in relation to generally understood timing used to build fan interest. 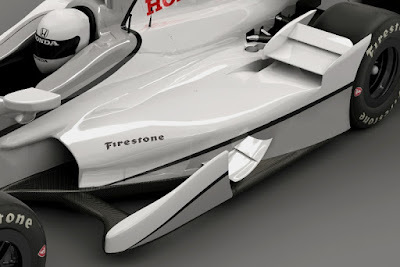 One wonders how fans, who support the series, are able to analyze and absorb the subtle aero approaches each manufacturer has adopted given that the Firestone Grand Prix of St. Petersburg, will be run in just about 3 weeks, on March 29, which marks the inaugural 2015 competition between the manufacturers' body kits. The speedway aero kit components are scheduled to be delivered to teams by April 1. 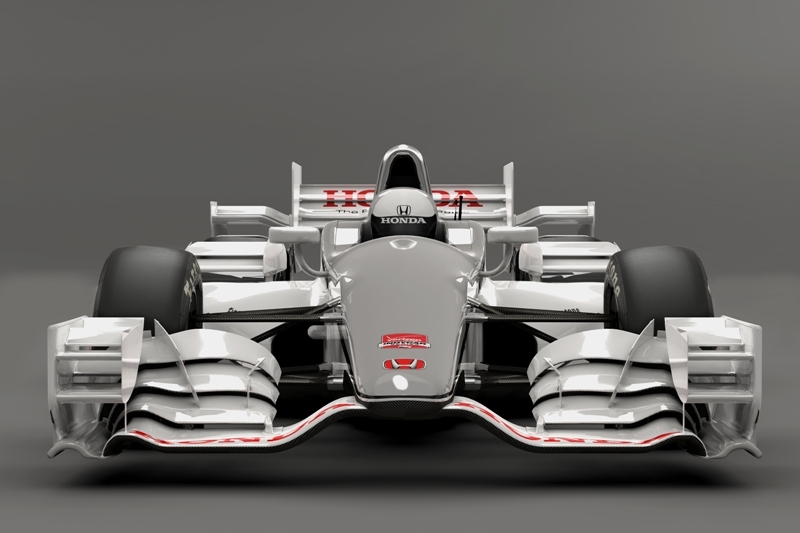 Below are full chassis images originally supplied by IndyCar from the manufacturers. 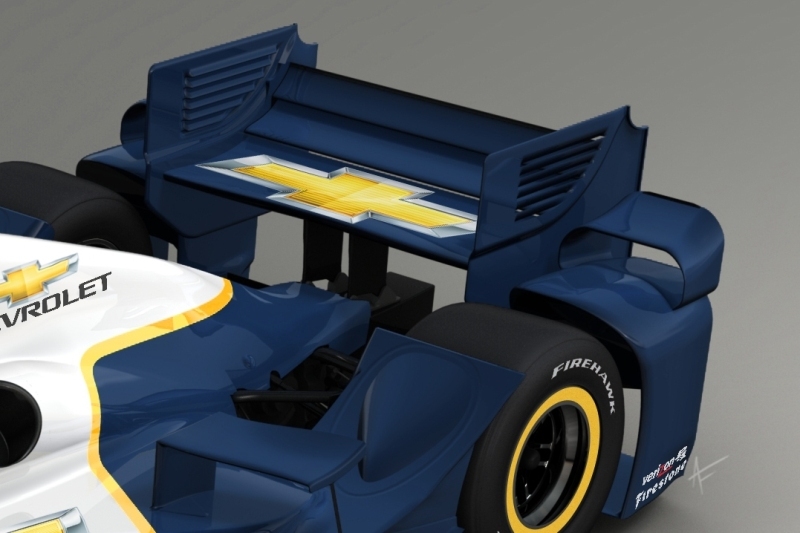 The larger hi-res images were cropped in order to bring a visual focus to the three main areas of where aerodynamic body panel manipulation takes place on the Dallara DW12 - the Front Wing, Sidepods, and Rear Wing body parts - for comparison. 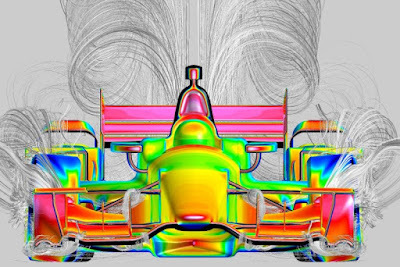 First, Chevy supplied the initial image that shows the fluid dynamics effect of their developed approach. The way the lines are drawn, it leads one to believe that the turbulent airflow coming from the back of the chassis has a strong upward motion soon after leaving the rear wing of the chassis. This fluid dynamics motion is called 'Mushroom Busting' (first coined by Swift Engineering during the Iconic Development Process) which moves the trailing turbulence, that forms in the shape of a mushroom cap, out of the way of the race car behind allowing for stability in racing and possible overtaking. This close-up view comparison has one potentially questioning whether Honda wishes to continue the same 'Mushroom Busting' competitive agenda, explored and - EXPLAINED HERE. The Chevy front end view seems to have less parts to get in the way of the fluid nature of air whereas the Honda front end has many more elements that appear to be aiding in the dropping of the turbulence mushroom so that it would act as an impediment to any car trailing the Honda-powered chassis. This close-up view comparison has one potentially questioning whither Honda wishes to continue the same 'Mushroom Busting' competitive agenda - EXPLAINED HERE. 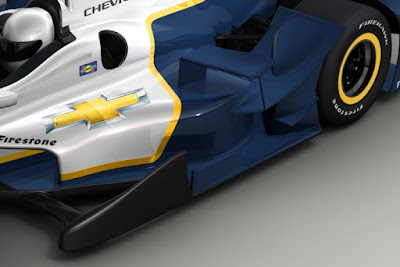 The Chevy front end & front wing views both seem to have less parts to get in the way of the fluid nature of air whereas the Honda front end clearly has more elements channeling and funneling the air. The sidepods housed the radiators in the original version of the DW12 so it is assumed the same function of the airflow through the housing performs the same benefit of cooling the engine. 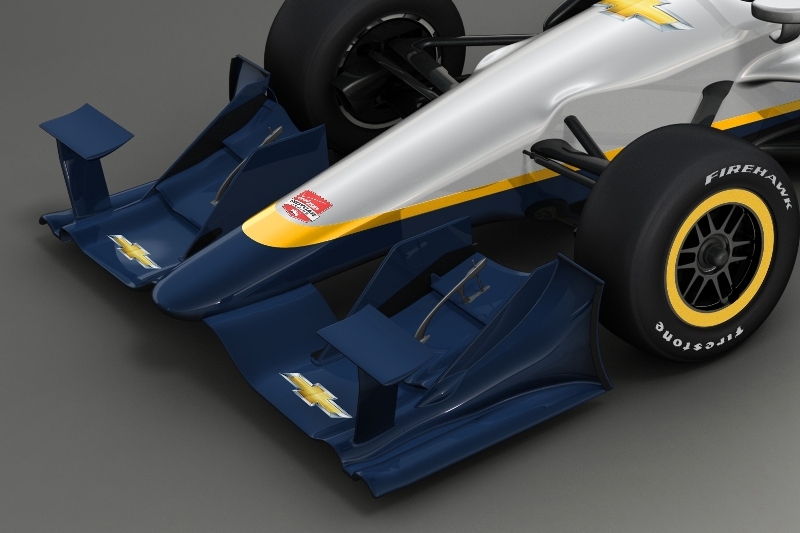 Again, the Chevy sidepod has fewer elements and an addition of an airflow pass through outport just in front of the rear tire. Chevy also supplied a component identification terminology plate which describes the flying wing on top of the sidepod as an 'upper flick' and the element in the middle of the back of the sidepod (main flick) as a 'wheel wedge' which looks a little like a shark fin placed on the pod. No component identification terminology plate was available from Honda/IndyCar so one is left to guess. The most interesting characteristic seems to be the integral nature of the sidepod without many add-ons or outports carving up the side, visually, and hanging above, leaving an uncluttered profile. For the Chevy rear wing, we almost instantly see louvers on either side of the main central fences or end plates. The louvers allow air flow to move from the central wing section defined by the fences over to the airflow on either side of the central wing. The Honda aero kit features an added fin along the backbone of the engine cover along with, again, more parts that appear to most observers to aid in the dropping the strength of the upward movement of the turbulent air mushroom cap ... but then, who really knows without the developmental CAD/CAM information and testing statistics. 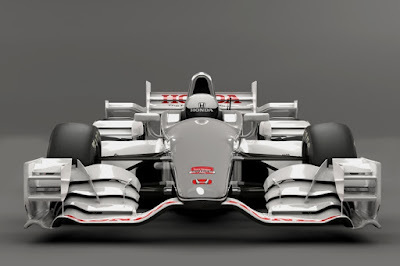 One might say that the Honda aero kit looks less than ... iconic. More parts placed at the corners of the racing platform also equal more Yellow Flag track litter. As an example that aids understanding in the philosophy that less parts that impede the flow of air is better, the new Nissan GT-R LM NISMO LMP1 employs the use of very large, designed-in airflow ducts where nothing invades the space of the duct. 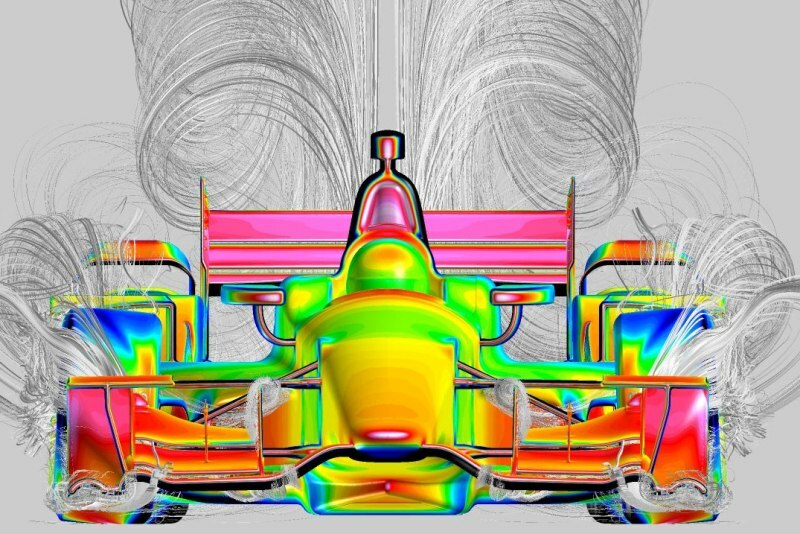 Designers spend thousands of hours coming up with the best way to make aerodynamic downforce while minimizing drag, and drag comes from interrupting the air. An LMP1-H punching through the air at 200mph is one giant exercise in disturbance, yet with Bowlby’s through-flow system, he’s found a brilliant method to work peacefully with the air as it envelops the Nissan via huge rectangular airflow channels that start at the rear of the splitter, wrap around the cockpit, and continue to the tail end of the GT-R LM NISMO LMP1. In practical terms, it’s the difference between the hull of an oil tanker making a huge wake and the razor-thin interruption made by an America’s Cup yacht. One thing for sure, only racing on the track will let fan, team, and driver alike really know for sure. If one hears about difficulty in passing a Team Honda car over the ease at passing a Team Chevy car just know that you heard the first speculation written about >>> HERE! 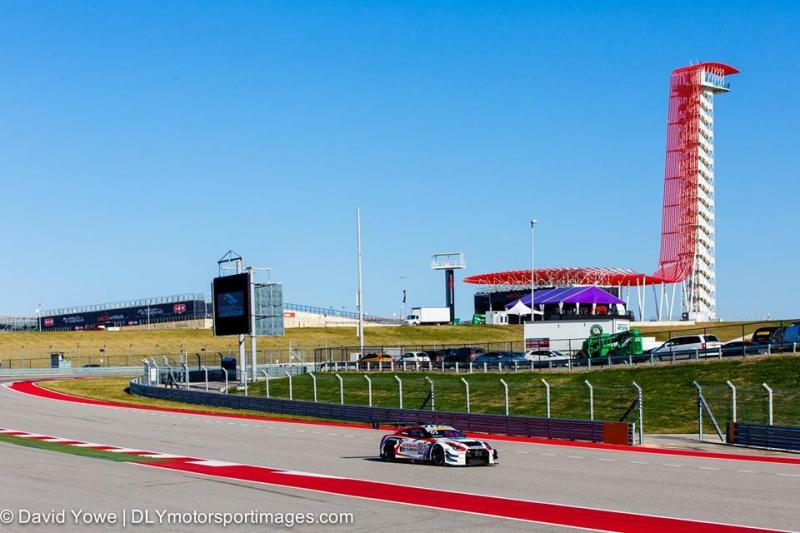 When one turns their attention to the season opener of the 2015 Pirelli World Challenge (PWC) of full-bodied race cars to be held this weekend at Circuit Of The Americas (COTA), one will find an almost confusing array of cars and classes to follow. GT Cup - Spec class featuring Porsche 991 Cup Cars that will run as part of the overall GT Class races, with a separate victory circle presentation alongside that of the GT/GTA class winners. GTS - Cars permitted in GTS are typically marketed as “sports cars”, “sport touring cars” or performance versions of “luxury” cars but at a lower permissible preparation level than GT. TC - Power output up to 300hp. Weight varies depending on the power output of the individual drivetrain configurations. Front wheel, rear wheel, and all wheel drive configurations are permitted. TCA - Power output up to 220HP.Touring Car A is an evolution of the current TC class specifications. It is developed to minimize the build cost of the TC platform. TCB - Power output up to 125HP Smaller cars with small, efficient, naturally aspirated motors. Modifications are limited to manufacturer specified performance spring and shocks to keep overall cost down. In an age of nearly spec/formula racing and single classes going head-to-head on an American race track, the number of classification of cars racing together head-to-head at the same time in the PWC has one wishing for the bring what you got racing of the INDY 500 of the historic past. The series has something to hold for almost anyone who loves a good contest. First up, let's look at a group of competitors who are driving one of the lagest auto marks represented in the field ... MAZDA! These cars may be smaller and in classifications that do not receive the main focus of a lot of fans, having ten hammer-and-tong competitors will add to one's race following pleasure. One of the great showcases for the quality, durability, and reliability of Mazda cars, and the skills of Mazda racers, is the Pirelli World Challenge. This year, ten Mazda racers will be taking the green flag for the three-day, three-race weekend beginning Friday, March 6, at the Circuit of the Americas (COTA) in Austin, Texas. Mazda racers compete in three of the seven classes in the field. The Mazda MX-5 will go head-to-head with Porsche, Honda, Nissan, Volvo, VW, and Ford in the Touring Car (TC) class. In the Touring Car “A” (TCA) class, for cars with fewer modifications, the Mazda RX-8 will compete with Honda and Kia. In Touring Car “B-Spec” (TCB), it will be the nimble Mazda2 up against the Honda Fit, Mini Cooper, and Fiat 500. 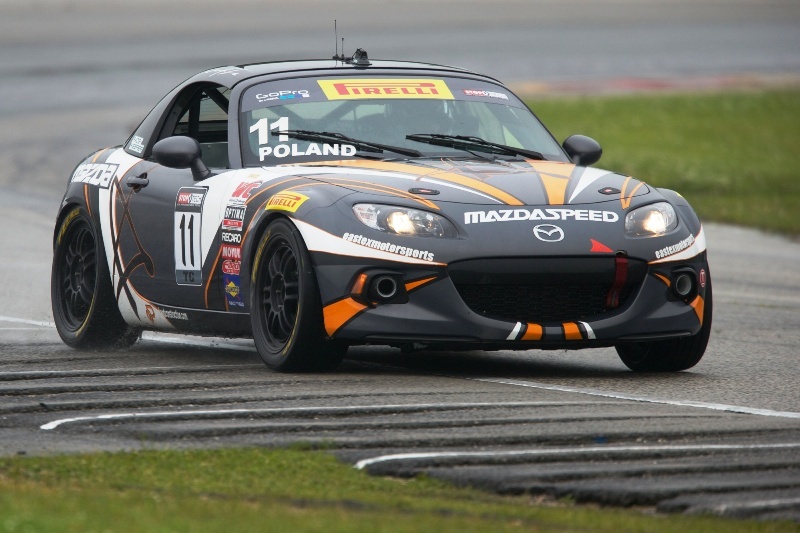 “It’s great to see so many strong Mazda teams ready for the 2015 Pirelli World Challenge. Mazda has a long history in the series, and we look to our current racers to add their names alongside past race winners and champions like Randy Pobst, Jeff Altenberg, and Michael Cooper. Having the season conclude at Mazda Raceway Laguna Seca in September will make this a special season for us,” noted John Doonan, director of motorsports, Mazda North American Operations. Porsche cars are well represented in the field as well, with cars racing in five of the seven classes - GT (1 - GT3), GTA (1 - GT3), GT Cup (all Porsche GT3 - 10 cars), GTS (3 - Cayman/Cayman S), TC (4 - Cayman). One of the young rising stars to watch in this weekend’s Nissan Grand Prix of Texas, as well as the rest of the Pirelli World Challenge season, is 24-year-old Californian Michael Lewis of EFFORT Racing. Lewis moves up from the IMSA Porsche GT3 Cup Challenge USA, where he finished a very close third [entering the last race weekend at P1] in the championship a year ago. While Lewis might be somewhat of an unknown quantity and a first-year driver in PWC, he has worked several years to achieve the position he has now, taking over the No. 41 Porsche 911 GT3 R that Michael Mills took to the 2014 GTA title. An open-wheel prospect who achieved success and race wins overseas in Formula 3 through 2013, Lewis had a sports car opportunity come up when he was one of four drivers invited to Porsche’s Young Driver Academy at the end of 2013. That opened the door for a switch, one that Lewis seized following the two-day test at Barber Motorsports Park. “Moving into sports cars was pretty seamless,” Lewis told Sportscar365. “It all came together through the Porsche Young Driver Academy, the precursor to the Young Driver Program we’re involved in now. Lewis entered with Competition Motorsports in the 2014 season and immediately inserted himself into title contention with a sweep of the weekend at Mazda Raceway Laguna Seca in May, his second weekend in the series. He added two more wins at Road America and Circuit of the Americas, but was caught out in the season finale at Road Atlanta, spinning out on a wet track just past the start of the race. While he lost the title, he gained a wealth of experience racing against Colin Thompson, Sloan Urry, Christina Nielsen and Angel Benitez Jr. for the title. Interestingly, all but Benitez have PWC programs lined up for this season. As Lewis now steps into the GT3-spec Porsche 911 GT3 R for 2015, based on the 997 rather than the 991, he described some of the differences between two similar but still different Porsche chassis he raced a year ago. “The biggest things from the GT3 R to Cup car R are we have ABS on our car, traction control, more aero, and more power,” Lewis said. Lewis won a shootout for EFFORT Racing’s second seat alongside Ryan Dalziel over the winter, and has prepared for the season in tests at Sebring and MSR Houston. Lewis already said he was soaking up information from Dalziel like a sponge. 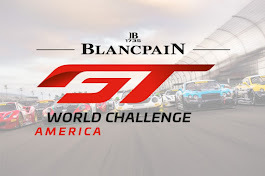 As one of the younger drivers in GTA, compared to a nonprofessional driver who only races part-time that make up the bulk of the 21-car class, Lewis has the potential to advance into GT with one overall podium finish or two overall top-fives. “It’d be awesome to start off winning, but right now we just need to do our job and stay clean,” Lewis said. 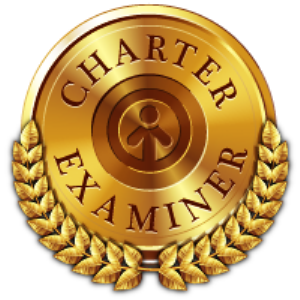 “This class has some really good drivers and it’s all a big unknown. The GT Class, however, will get most of the attention because of the diversity of auto marks and drivers that fill this field. The Circuit of the Americas is the site of the 2015 season opener for the Pirelli World Challenge Championships. The series’ 26th season kicks off at the 20-turn, 3.4 mile permanent road course, with action across all seven series divisions. 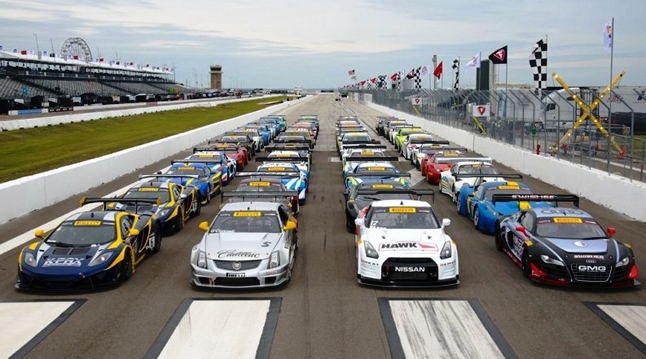 Over 100 cars are entered for the Nissan Grand Prix of Texas brought to you by Motul. A host of familiar names are joined by a wealth of talented newcomers, either in the form of new drivers, teams, manufacturers or cars. The continued integration of FIA GT3-spec cars in GT has provided continued manufacturer and team growth for the 2015 Pirelli World Challenge season. The series last visited COTA in 2013 running the modified 2.3-mile National Circuit course and the track proved to be the perfect site for some exciting races and this year’s rounds should be no different with the move to the full track. Pirelli World Challenge GT: O’Connell Leads a Deep, Talented Field - Johnny O’Connell repeated as the Pirelli World Challenge 2014 GT champion after a dramatic victory weekend in last year’s season finale at Miller Motorsports Park. He’ll begin the quest for his fourth title in a row at a track where he won the Round 1 race to open up the 2013 season. A wrinkle for O’Connell, of Flowery Branch, GA., is that he returns to defend his championship in the new No. 3 Cadillac Racing Cadillac ATS-V.R. Teammate Andy Pilgrim, of Boca Raton, FL., returns in the No. 8 Cadillac Racing Cadillac ATS-V.R. Pilgrim finished fourth overall in the 2014 GT Drivers’ Championship, helping Cadillac to its third straight Manufacturers’ Championship. Mike Skeen, of Charlotte, NC, will lead CRP Racing’s effort in the No. 2 Hawk Performance Audi R8 ultra. 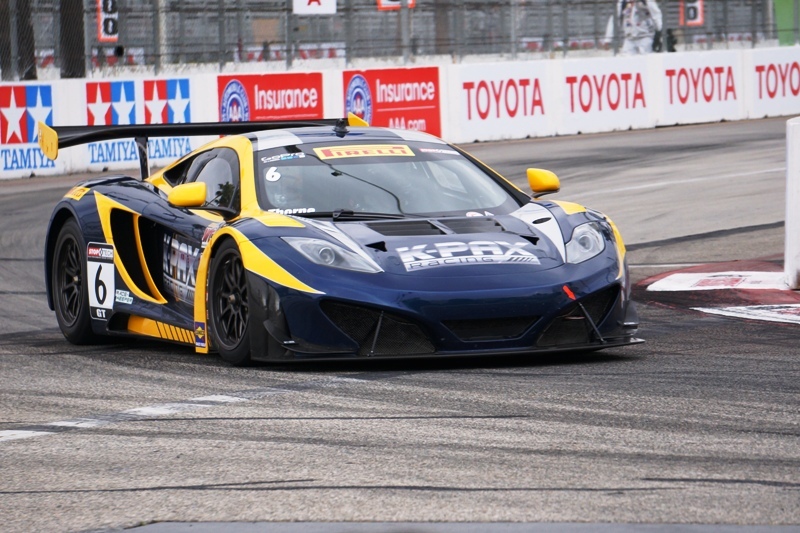 Skeen pushed O’Connell hard in the battle for the GT Championship last year ultimately finishing second overall with three wins on the season (Rounds 7 and 8 at Road America, and Round 13 at Sonoma). Bentley Team Dyson Racing returns with veteran sportscar racer Butch Leitzinger, of Rebersburg, PA and teammate Chris Dyson, of Pleasant Valley, NY, piloting two Bentley Continental GT3s. Leitzinger, behind the wheel of the No. 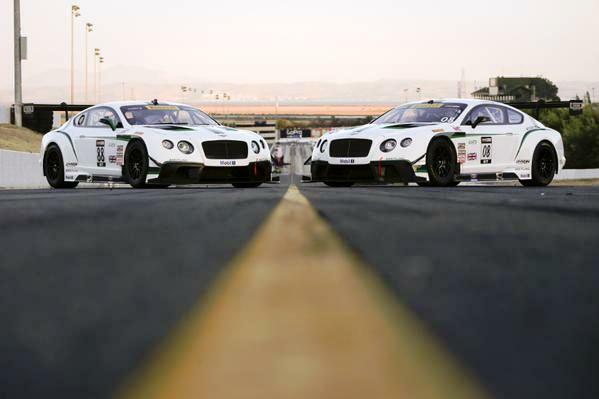 20 Bentley/Breitling/Mobil1 Bentley Continental GT3 closed out 2014 with four top five finishes including standing on the podium twice with two thirds. Dyson will pilot the No. 16 Bentley/Breitling/Mobil1 Bentley Continental GT3. After their initial season that was essentially a development year, the team looks to challenge for wins and championships in 2015. 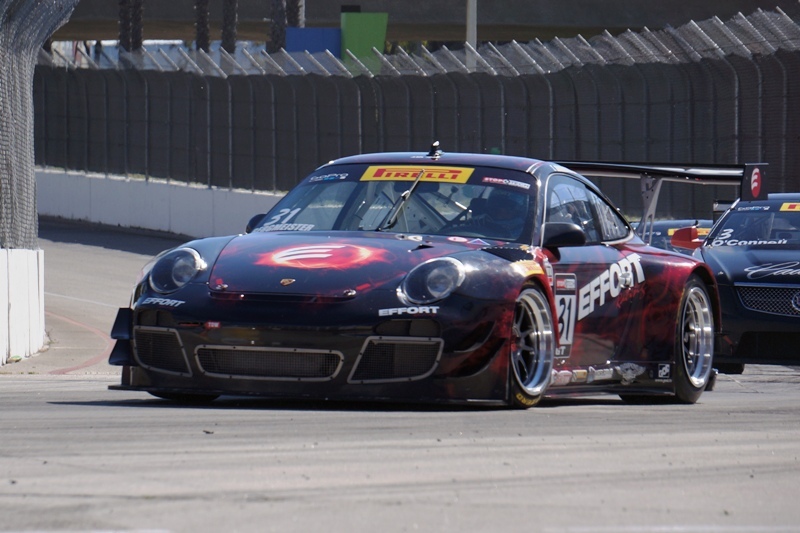 EFFORT Racing returns to challenge for the GT title with standout racer Ryan Dalziel of Windermere, FL., piloting the No. 31 Porsche 911 GT3R. Dalziel won back-to-back Round 11 and 12 races at Mid-Ohio last year after joining the team at the mid-point of the 2014 season. K-PAX Racing returns with two McLaren 650S GT3s with Kevin Estre, of Locmau, Austria in the No. 9 machine and Robert Thorne, of Littleton, CO, in the No. 6 car. The team debuted the McLaren 12C GT3 in the series in 2014 and after a hard luck season Thorne won the final race at Miller. Now partnered with Flying Lizard Motorsports the team looks to continue that momentum into 2015. R. Ferri Motorsport returns with the No. 61 Ferrari of Ontario/Toronto/Alberta Ferrari 458 GT3 Italia, driven by former F1 pilot and GT sportscar veteran Olivier Beretta of Monte Carlo. The most successful driver in series history, seven-time Drivers’ Champion Peter Cunningham, returns in the Acura TLX-GT prepared by his RealTime Racing operation. The Milwaukee native, who will drive the No. 42 RealTime/Acura Motorsports/HPD Acura TLX-GT, started three races in 2014 to develop the all new and only all-wheel drive platform in the series. Cunningham owns almost every statistical record in the series and looks to add to it in 2015. Ryan Eversley, of Atlanta, GA, joins the team to run the second Acura TLX-GT and will pilot the No. 43 RealTime/Acura Motorsports/HPD car. One of the biggest pieces of off-season news came from Nissan Motorsports and the announcement of its partnership with Always Evolving (AE) to campaign two GT Academy-NISMO Nissan GT-R GT3 racing cars in Pirelli World Challenge. Australian open wheel and GT star James Davison will pilot the No. 33 AE/ReplayXD/NISSAN NISMO GT-R GT3. Prototype and GT racing veteran Guy Cosmo, of Palm Beach Garden, FL, makes his first start in Pirelli World Challenge. He will pilot the No. 23 Tampa Bay Jaw Surgery Centers M1 Racing LLC Audi R8 LMS ultra. Nicky Catsburg, of Voorthuizen, Gelderland, makes his first Pirelli World Challenge start in the No. 25 Blancpain Racing Lamborghini Gallardo GT3 FL2. The 26-year-old Dutch driver has signed on for the full season of Pirelli World Challenge. Scuderia Corsa brings two Ferrari 458 GT3 Italias with Mike Hedlund, and Duncan Ende piloting the cars. Hedlund, of Woodside, CA, will pilot the No. 65 machine, while Ende, of Los Angeles, CA, will pilot the No. 64 Merchant Services LTD/Linospresso USA car. Series veteran GMG Racing’s James Sofronas, of Pound Ridge, NY, returns in the No. 14 GMG Racing/Spyder/Mobil 1 Audi R8 LMS ultra. Sofronas has over 170 Pirelli World Challenge starts and won the Round 2 race at COTA back in 2013. Sofronas’ teammate Madison Snow, of Provo, UT, will pilot the No. 21 Audi R8 LMS Ultra Audi R8 ultra. Rounding out the GT field is three-time World Challenge Drivers’ Champion Lou Gigliotti, of Plano, TX, in the No. 28 LG Motorsports Aston Martin GT3 V12. 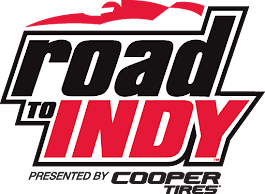 Indycar (237,000), United Sportscar Series (104,211). Facebook likes have increased by over 20% year over year and the engagement/interaction level of our fans on the page has quintupled. 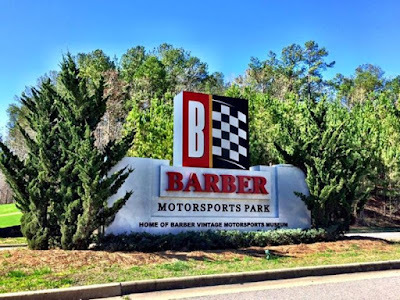 The page has over 610,000 Likes and during our Barber race weekend, We had a peak of over 179,000 people that were directly engaged with our posts. Each event is a triple-header, with three races per weekend, for an 18-race season. Wednesday, March 18, 8 PM Eastern: TC, TCA, TCB. GMG signs Madison Snow to the first race of the Pirelli World Challenge Championships being held next weekend at Circuit of the Americas in Austin, Texas. They are hoping this leads to a season ride for Snow at GMG but a few things have to worked upon to make this happen. After interviewing both Fabryce Kutyba and James F. Sofronas, GMG co-owners at the GMG open house in Santa Ana, California this last weekend, Fabrice believed that Madison had driven a race prepared Audi at a closed track and James believed that Madison had not had the chance to fully test the Audi. All are happy at the chance at having Snow drive a first class race prepared Audi which is a big change for Madison Snow for his experience has been almost exclusively with Porsche platforms. Does this point towards a bit of a drawing away from Porsche toward Audi in a GT competitive series? The question is somewhat valid since longtime Porsche race team Flying Lizard (TUSCC) having also made the jump to Audi cars.